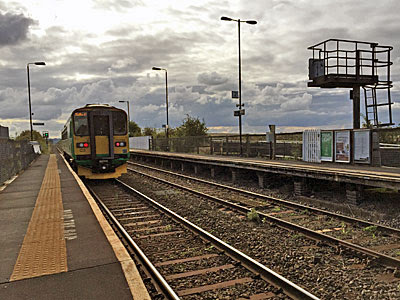 Having already visited the least used stations in Berkshire, Hertfordshire, Greater London and Essex, here's an even quieter one in Bedfordshire. My target is on the Marston Vale line, an unlikely Beeching survivor linking Bletchley to Bedford. Despite an hourly service this particular station attracts an average of only 25 passengers a day, that's not even one per train. I was surprised it's that many. Just me then? Thought so. I've been deposited on a low wooden platform, one carriage in length, which is another clue as to potential footfall. Interestingly the opposite platform is twice as long, having been deliberately extended, but the southbound remains its original stunted self. The guard peers out of the front of the train to check what I might be doing here, then ducks inside and the Sprinter departs. 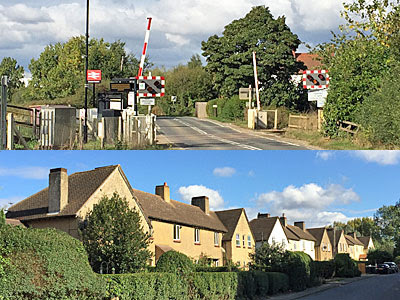 Kempston Hardwick station is located between two fields at a level crossing, across which a succession of cars and lorries sporadically careers. Both platforms open out towards the road, while halfway up each is a superfluous step-free ramp, one of them sealed off and slightly overgrown. Only northbound passengers get a bench and shelter, this being the more likely direction for a commute, not that many people seem to bother. 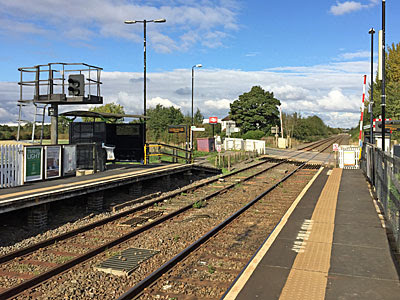 White picket fences give the platforms a genuine rural railway feel, as does the notice saying "There are no bus services serving this station". There are also two Next Train Indicator boards, one at each entrance, exactly the same as you'd find on the tube at Whitechapel or Barking (only with a far less good service). 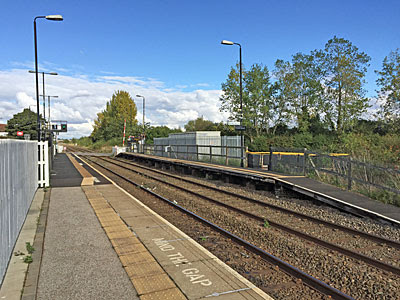 Kempston Hardwick station attracted notoriety back in 2003 when statistics revealed it was one of the least used stations in the country. Only 38 passengers per month were passing through, the equivalent of maybe two commuters, causing national newspapers to send journalists to experience the bleak ennui for themselves. One of the problems was apparently the lack of parking space, although there is now a rough turnaround space beside platform 1 where the crossing keeper's cottage used to be. A bigger problem is the lack of potential customers on the doorstep. The (substantial) village of Wootton lies a mile away across the fields, but few would walk that far, and after dusk in winter the footpaths and lane inbetween would be positively unwelcoming, even downright dangerous. The village of Kempston Hardwick is a linear settlement, for which read a few houses strung out along a road. I wandered off to take a look, sticking to the narrow verge above the traffic to avoid being mown down. The first houses appeared after a couple of minutes, a pebbledash parade opposite a single lamppost, plus a noticeboard listing the latest parish council agenda. Further down (but sadly invisible from the road), a moat is all that remains of Hardwick Preceptory, a 13th century priory of the Knights Hospitaller. A few industrial premises follow, intermittently, before reaching what might be called the centre of the village, by the Chimney Corner pub on the Bedford Road. The mainline to St Pancras runs close by, but wouldn't pause for a hamlet like this. It'd make a lot more sense to have a station at Kempston, Bedford's largest satellite, than out here in the middle of nowhere. Hundreds of potential commuters might choose to start their journeys here rather than battling the traffic jams into town, and the aforementioned retail park would suddenly become a lot more accessible to those without a car. 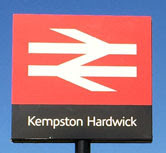 Instead Kempston Hardwick gets the hourly trains, the fortunate recipient of budgetary inertia. But there is major upheaval on the horizon, with the Marston Vale line a linchpin of the proposed East West Rail Route. This key infrastructure project seeks to reconnect Oxford and Cambridge along a line built by the Victorians and severed by Dr Beeching. The first section out of Oxford is due for completion this December, then a freight line east from Bicester will be appropriated and several miles of disused tracks reinstated. Bletchley to Bedford already exists, but from there to Cambridge things get tougher as the old route has been built upon in several places, and a new path will be needed via Sandy. All sorts of exciting new connections will be made possible, maybe by 2019, maybe by 2024, especially for freight traffic which will be able to follow a new 'Electric Spine' across the country. The tracks through Kempston Hardwick will be a lot busier, but none of the additional trains will be timetabled to stop. The line's so straight here that it's possible to see my returning train four minutes away as it stops at Stewartby. This time I'm on the two-car-length platform and a 2-carriage train turns up, which can't be operationally deliberate and must be a coincidence. The button by the door takes an age to light up, raising the prospect of being stranded here another hour, before finally permitting admittance. Just me, of course. It's not far back to Bedford, past the ex-brickworks and quarried pits, the industrial estates and retail park. There are several reasons to visit the Marston Vale by train, but rest assured Kempston Hardwick isn't one of them.